Our first quarter knocked it out of the park. Normally Q4 is the highest quarter in the year, but we eclipsed last year's Q4 handsomely. Year-over-year, Q1 of 2015 was 354 percent over Q1 2014. We are adding well over 100 enterprise acccounts per month, with an increasing Average Sales Price. You can see the graph to the right. We have committed to taking the 12-th floor of 33 N Garden Avenue, a 15,000 sq ft floor where we have space to expand to 100 employees. This floor happens to be the old Sunbelt Software office that was turned over to GFI in 2010 after the acquisition of Sunbelt Software. We are doing a complete renovation and are getting rid of all the cubicles that were there and we are creating a clean-looking open office environment. 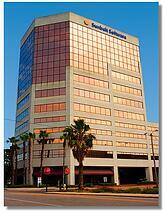 Soon you will see the new KnowBe4 logo on the top of this building. Many of us in Knowbe4 are ex-Sunbelt Software employees. On the left is the building we are moving into. KnowBe4 is now the world’s most popular integrated Security Awareness Training and Simulated Phishing platform. We have over 1,200 enterprise accounts that are using it to train their employees against phishing and social engineering, 25% of which are banks and credit unions. KnowBe4 is hiring. We are looking for smart, able, and fun people for sales, support, renewals, roll-outs, deployment, accounting and marketing. Send your resume to HR at KnowBe4.com, or tell your friends that are looking for a new job.